Normalizing the arts as a part of your children’s lives is really important. We western North Americans are pretty deprived in this department, whereas in the big US cities and throughout Europe it is perfectly normal to take your children to many fine arts activities, and many of these are lower priced than they are in Calgary! 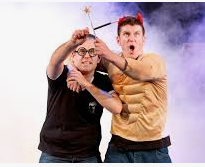 Potted Potter is a parody of the Harry Potter series in musical form, highly touted by the major arts reviewers, and with tagline “All Seven Harry Potter books in Seventy Hilarious Minutes”. Runs in Calgary only February 5-18, 2019 at the Martha Cohen theatre. Vocal Technique Basics – Should I sing if I have a cold?